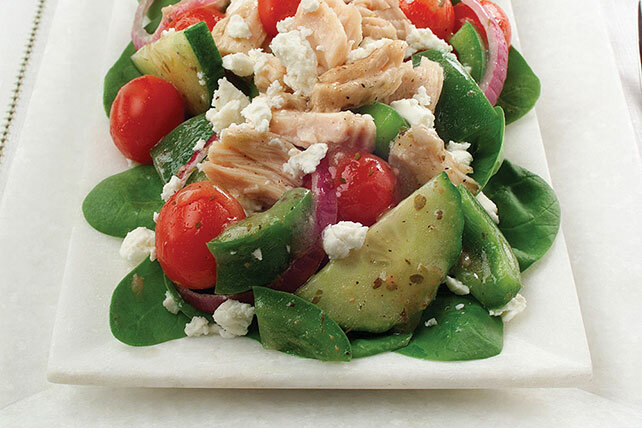 Feta cheese, tomatoes, red onions and cucumbers give this big spinach salad with tuna its decidedly Greek flavor. Place spinach on large serving platter or divide evenly among four salad plates; set aside. Combine tomatoes, peppers, cucumbers, onions and tuna in medium bowl. Add dressing; toss to coat. Spoon over spinach; sprinkle with cheese. This main-dish salad provides more than 1-1/2 cups of the recommended 2-1/2 cups of vegetables per day. Prepare as directed, using KRAFT Light Red Wine Vinaigrette Dressing and 1 pkg. (3.5 oz.) ATHENOS Crumbled Reduced Fat Feta Cheese. For a meatless version, prepare as directed substituting 1 drained can (14 oz.) chickpeas (garbanzo beans) for the tuna.